Australia reached 119-3 in its second innings to lead England by 200 runs in the third Ashes cricket Test in Perth as 13 wickets fell on day two. Left arm fast bowler Mitchell Johnson, who top scored in Australia’s first-innings 268 yesterday, turned the day, match and series upside down with six wickets for 38 to give his side an unlikely first innings lead of 81. England team started well on Friday and had raced to 78 without loss off 24 overs closing in on Australia’s first innings of 268. But Johnson made the difference with two stunning spells of bowling that marked a miraculous return to Test cricket. Only Andrew Strauss (52) and Ian Bell (53) offered any resistance as the tourists collapsed to 187 all out. Johnson removed Cook, England's leading run scorer in the series, for 32 then Jonathan Trott, who contributed just four runs to his side, and Kevin Pietersen for a duck. Ryan Harris dismissed Captain Andrew Strauss for 52 and when Johnson had Paul Collingwood trapped lbw for 5 with another swinging, full-pitched delivery, England found themselves five wickets down before lunch. Harris struck again when Bell, after top scoring with 53, edged to Ponting at third slip to make it 186-8 in the second session. Peter Siddle chipped in to remove the last recognized batsman Matt Prior for 12 with Johnson and Harris mopping up the tail. 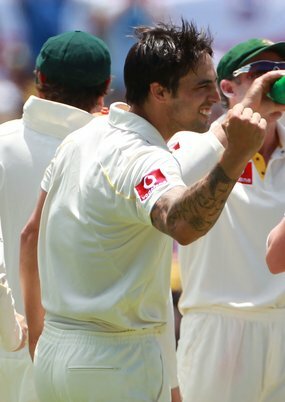 Johnson completed his five-wicket haul with another fine inswinger that flattened Chris Tremlett's off stump, and two balls later Anderson prodded outside off-stump to gift Watson a simple slip catch.Dropped after his ineffective performance in the drawn Test in Brisbane, Johnson rediscovered his best form in stunning fashion on the ground where he took 8-61 against South Africa two years ago. "Hopefully I've found something that's going to really work for me," Johnson told Grandstand at the close. Cricket's a tough game and some days you have those ups and downs. I guess it's just finding that balance. You never really have too many good days but when they come along you enjoy it." Australia made a solid start to their second innings, seeing off James Anderson's opening spell before Watson helped himself to three fours off Steve Finn's first over. But the tall paceman, Steve Finn, rebounded to remove Phil Hughes and the Australian captain Ricky Ponting. Chris Tremlett took the wicket of Michael Clarke who looked in the attacking mode.